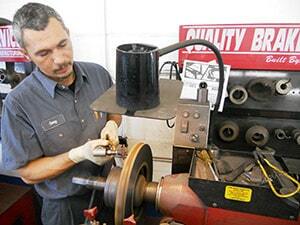 Quality brake repair service should be every driver’s top priority. At USA Automotive our talented team of certified automotive technicians performs expert brake repair in Raleigh, NC to keep you and your passengers safe on the road. We stay on top of your vehicle’s braking system by performing timely inspections and efficient maintenance services to further enhance your brake system performance. Don’t wait for your brakes to fail! We believe in a proactive approach to brake repair and overall auto maintenance. Rather than wait for your brakes to malfunction, we help you stay ahead of any brake repair needs by having our brake repair experts identify any potential problems, and address them before they become dangerous. Not sure when you should have your brakes examined? We can help. Let us prepare your vehicle for the approaching season. Pay attention to all your brake system’s warning signs, and bring them to us for inspection as soon as possible. When drivers are able to recognize the warning signs, they’re able to be proactive with their brake services. Bringing your vehicle to our repair facility before it’s too late will protect you, your passengers, and your braking system. A high-pitched screeching sound when applying pressure to your brakes – This indicates that your brake pads have worn too low and they need to be replaced. Braking systems are built with this alert so that owners are aware of their need to replace brake pads. Reduced responsiveness or fading of the brake pedal. A grinding or growling when you depress the brake pedal – If you feel this, then it likely means that you have worn down your brake pads almost completely. You should cease driving immediately and bring your vehicle to us. Fluid leaking from the brake hoses or the wheel & tire area. 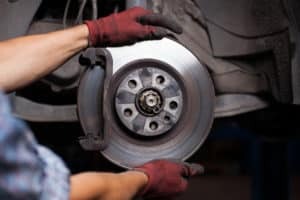 Drivers will sometimes miss common warning signs for brake repair because they simply can’t hear it from behind the steering wheel. By occasionally driving with your windows down you will be able to hear any abnormal sounds. Our team can provide early intervention to your braking system to avoid dangerous road travel and costly repairs. If you ignore these early warning signs, your braking system can suffer extensive damages. The sooner you bring your vehicle to us, the better chance we’ll have of sparing you replacement part costs. We are equipped to perform any repairs or replacements for your brake system parts, such as brake rotor or calipers. Located in the 27604 area of Raleigh, NC, USA Automotive is the area’s trusted expert for of all your braking system needs. Stop by our shop and let our auto technicians give you an accurate diagnosis for the most efficient and effective brake services. You can count on us to steer you clear of any breakdowns and use every visit to enhance your vehicle’s overall performance. Call us at 919-249-5295 to schedule your next brake repair or maintenance service. For your convenience, you can pick a day and time that works for you right now. Feel free to use our online scheduling system!